This time of year you can expect to see articles about healthy holiday eating and tips to stay off the couch during winter vacation. While we are proponents of wise food choices and provide assistance with exercise and sports performance anytime, we would like to talk about another important, holiday-related health issue. It’s not uncommon to experience an increase in stress during the final months of the year. It’s important, too, to make sure it doesn’t take over your life. Holidays tend to add more work to our schedules. We may stay on the job late to ensure deadlines are met before offices close for Thanksgiving and Christmas, yet still check our email when we aren’t at the desk. We either plan to have family and friends over for the big dinners or make arrangements to travel. Whatever we intend for the season, a long to-do list typically follows. Add to this the barrage of ads announcing doorbuster sales, and it’s enough to send you back to bed until January. It’s understandable to want a perfect Thanksgiving and Christmas or Hanukkah and to ensure your family is together and happy. You shouldn’t, however, feel the need to exhaust yourself making it all happen. Holidays allow us time to breathe and set aside tasks for the next work day. This year, as you plan special events at home or with friends, be kind to your body and mind and avoid holiday stress. Stay Hydrated. Ever have one of those days where you don’t drink enough water? You feel it later on, and it’s not pleasant. Make sure you get enough water when the holidays keep you busy. You’ll feel more energetic and capable of completing chores. Get Out and Walk. Gift shopping on Black Friday doesn’t necessarily count as exercise. You may engage in some extensive mall-walking this year, but set aside some time for a stroll in the neighborhood or a nearby park. Enjoy the fresh air and walk at a comfortable pace for a mind and attitude boost. Put Down the Phone. This may be the most difficult task for some people. If you know your job email can wait until the holidays are over, don’t open it. Don’t allow work to draw you down a rabbit hole that prevents you from enjoying your time off. 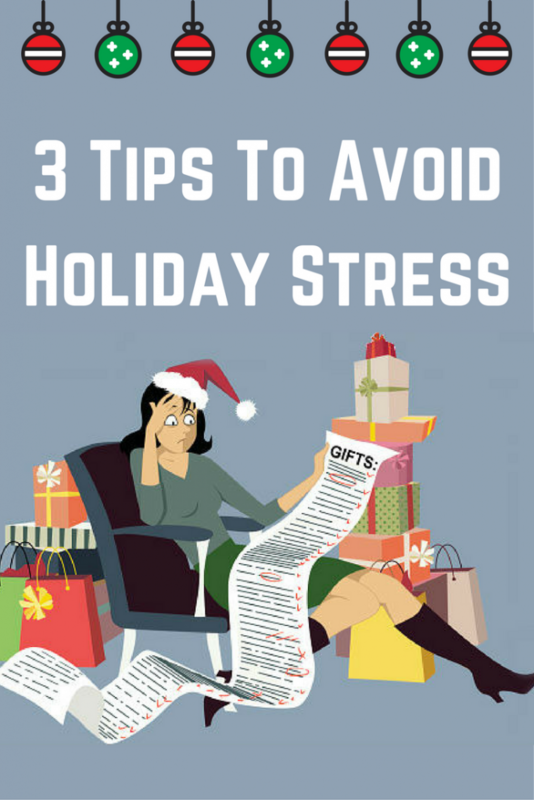 Stress doesn’t take days off, so when you feel it growing, listen to your body and mind and take steps toward easing your holiday-related frustrations.